CALL in Show ‪ . #‎OHIOStateCandidates‬ with Andrew C. Hall (R), Ohio State Rep. 22nd District and Challenger David Leland (D) on-Air with E Michelle Lee radio talk show host- TODAY Live 12-2PM 1-877-932-9766. 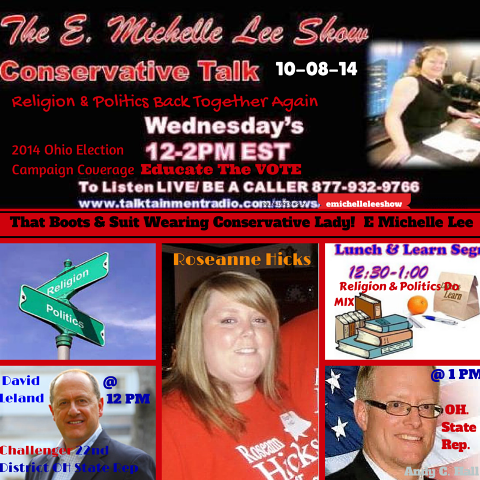 Join Radio Show Host, E. Michelle Lee, TODAY: Wednesday 12-2PM EST for a LIVE discussion about Religion and Politics when where and how they split, with Guest, Roseanne Hicks. NEW SEGMENT: 2014 Ohio Election Campaign Coverage. Giving you both sides so you can decide. VOTE your values and your faith this coming November. Help bring America Home. During the second hour of the show; we’ll have lines open for discussion (877-932-9766) and for those that want to Take The Challenge “Help Educate The Vote” to show your patriotism for this Country! Guess What E. Michelle’s “Are You Serious” pic of the week is???? I dunno– our Guest will be bringing it to us today. Roseanne Hicks in studio today w/ E.
OR- Download The Free Talktainment Radio APP and listen on the gO! PAIN Levels- What’s your threshold? My Hope & Marcy- Short Inspirational Story by: E. Michelle Lee , radio talk show host. Breaking NEWs in RAdio- Exceptions To The Rules Radio Show May Be On The Rise – These Communities Need it for sure.